When Emily, Susan and I swam across the Strait of Gibraltar last summer, our friend Mark crewed for us and made a huge difference in our swim. He wrote a hilarious post about his experience crewing for us. At that point, unbeknown to us, he set an objective to swim Gibraltar himself the following summer. With six weeks to go for his swim, Mark writes about his preparation and his transformation over the last year. Congrats Mark, you’ll do great! Last summer, thanks to the inspiration of my Swim4Good friends Emily, Susan and Mauricio, I caught the crazy Gibraltar bug. I was fortunate enough to be present for their big swim from Spain to Morocco and assist in the last few months of their training. It was a thrill to be able to share their experience. Could I do this swim too someday? Next summer? These three athletes are fast, competitive, proven swimmers who have swum for many years. I knew how to swim but was not a “swimmer”. 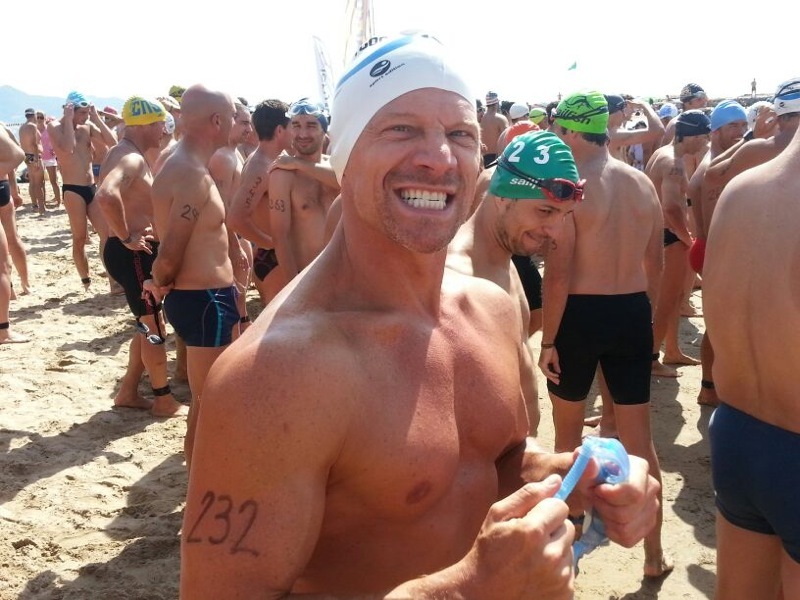 Could a 44 year-old non-swimmer train for 12 months and swim across the Strait of Gibraltar? Would I need more time to get up to speed? Or is it simply too late in my life to try something like this? In the end I decided to jump off the proverbial deep end and commit to the training. I applied to the Gibraltar association and was lucky to receive a date to attempt a crossing. Which is now a month and a half away. And to think that, when I was a kid, I used to lock myself in the car in the pool parking lot to avoid attending swimming lessons…. So how does an average joe (or jane) prepare for something like this? First, in order to get permission to cross the Strait, one must complete an incredibly thorough medical examination. Mine involved 19 different appointments with doctors from 5 different specialties. In the end, I was given the green light. My 44 year-old body is like a car at 44,000 miles: a little rusty, makes some funny noises, but OK for a long trek south. My preparation has basically involved spending as much time in the sea and in pools as possible. I am following Mauricio’s suggestions that he posted here back in July. Swim4Good has been incredibly supportive, putting together various training sessions and offering technical tips. Whenever I put on my S4G cap I am harnessing this special superfriend energy, which helps me train even harder. As if the long hours of training weren’t enough, Mauricio has included the added challenge of cold water acclimation to my plate. I will wear a wetsuit during the big swim, but getting used to colder water is still important, especially since the crossing will be attempted in the early part of the season. So I am spending more hours swimming outdoors in cold water without a wetsuit, and despite the cold I actually prefer it to swimming laps in a warm, chlorinated, crowded indoor pool. Watching the beautiful distractions in the sky over Barceloneta beach helps keep me warm psychologically: the planes taking off and landing, the full moon rising, the clouds slowly turning pink in the late afternoon. Maybe this is the delirium that takes over right before hypothermia. I imagined that, as a side benefit, all of this swimming would help me shed some extra pounds. I have actually gained weight, however, and weigh now more than ever! Is it nerves? Carb (over) loading? Am not blaming S4G’s proven gin & tonicregimen for Gibraltar. ¨Gin helps ward off predators,” Emily insists. Apparently the body reacts to these long swims and cold water shocks by building a reservoir of additional fat? At least it will help me keep afloat. My subconscious has been the most difficult part of the body to train. I have begun to have some strange swimming dreams: in one, as I dreamt that I was in the water and approaching the coast of Morocco, the authorities had put up one of those long, windingartificial queues like they have in the airports. So I had to follow it, swim back and forth, and the line kept growing longer and they continue to add more lines, and I could never reach the coast. In any event, training for this swim has been the cure for my mid-life crisis: some people buy a sports car. Some get divorced. My mom got her pilot’s license. I will attempt an 18km swim between two continents. Having been in the boat last year during S4G’s crossing has helped me prepare for a successful swim. Every crossing is different, but I know basically what to expect and incorporate it into my daily training: breaking every 45 minutes to refuel; practicing breathing on the right side as well as the left; and pushing hard during the last 20 minutes of every session, to help me get through that angry current that will be waiting for me as I near the end. 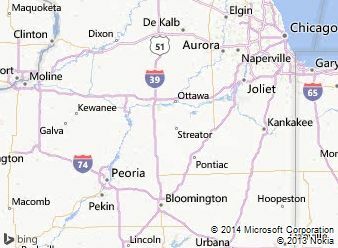 When I was back home visiting my parents earlier this year, I realized that the distance from Spain to Morocco is roughly the same as the distance between my hometown of Streator, Illinois, and Ottawa, the county seat and the city where I was born. So to make this trek seem more manageable, I envision this swim as one from Streator to Ottawa along Route 23: past Richard’s Road, through Grand Ridge, next to Pine Hills Golf Club, and then I touch Africa. I can do this! One reason why I am doing this swim is to call attention to migrants who risk their lives to cross these waters in search of a better life. The Strait of Gibraltar maintains a border between 2 countries that have one of the biggest differences in living standards in the world. The GDP of Spain is nearly 10 times that of Morocco. According to The International Organization for Migration (www.iom.int), last year saw the highest number of deaths from migration worldwide, and 1/3 of those occurred in the Mediterranean. I am dedicating this swim to those migrants in search of a better life; to raise awareness about how to improve their prospects and make migration safer for those who fleeing war and persecution; and to support organizations like Refugepoint (www.refugepoint.org) who assist forgotten and vulnerable refugees in Africa and help to find them safe haven and reunite with family. So with a month and a half to go there is still more training to be done, but I have wholly embraced the experience: surviving the monotonous kilometers in the pool, withstanding the cold water, relishing the marvelous Mediterranean. Am still not very fast, but my technique has definitely improved. Even if I am unable to swim all the way to Ottawa, I will have enjoyed this new endurance training, the memories of those late afternoon Barcelona skies, the commitment to improved migration in the region, all of the great people I’ve met over the last year – and this wonderful, wild process of finally becoming a real “swimmer”. Go,Mark! I know you can do anything you set your mind to. I will be anxious to hear how it goes. Wish you all the best. I’ll be cheering in Ottawa. Thanks for sharing your thoughts on why and how you’re attacking this amazing fete, Mark. As a retired Synchronized and Masters Swimmer, I am impressed by your decision to do this and look forward to the updates………Carol Telling.